Cyberspace stock images by Aurielaki. 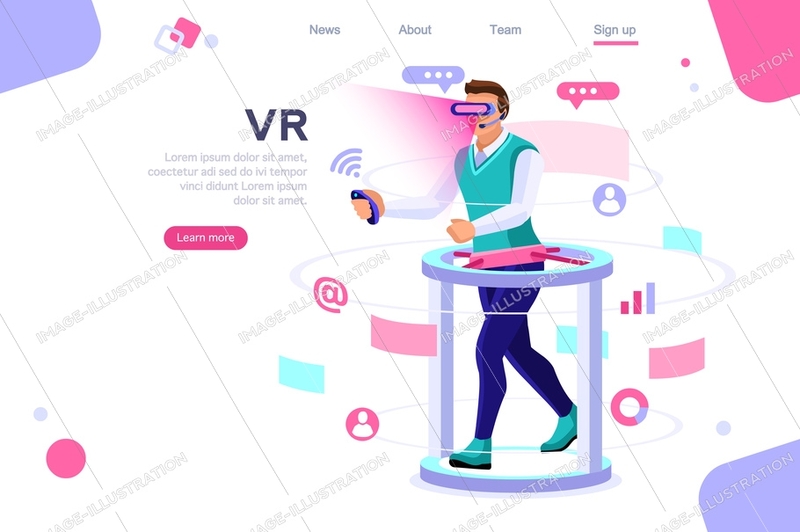 View Experience illustrations in EPS10 EPS JPG AI SVG. Visual images, virtual experience view. Cyberspace, flat multimedia work concept. Can use for web banner, infographics, hero images. Flat isometric vector illustration. SKU: Cyberspace-Experience-View-AurielAki. Categories: Game Icons, New. Tags: 360, abstract reality, augmented, banner, boy, character, cyberspace, digital, display, equipment, experience, flat, future, futuristic, game, glasses, guy, headsets, hero, hologram, human, illustrations, images, infographic, infographics, interface, isolated, isometric, man, multimedia, neon, page, people, person, reality, role, screen, simulation, tech, template, user, videogame, view, virtual, visual, vr, wear, web, white, work.